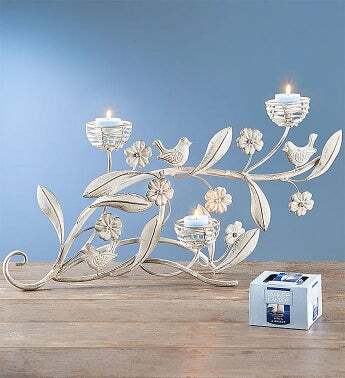 EXCLUSIVE Give their nest a spring refresh with our charming bird candelabra. Beautifully crafted with an antique white finish, our rustic metal décor piece is realistically designed with tree branches, birds and floral accents. Three nest-shaped holders are the perfect resting spot for the included Yankee Candle® tealights, which fill the air with the subtle scent of a fresh sea breeze.